Read the EMC’s highlights of EVS29 in our June 2016 Newsletter. Organized every 18 months, the largest world symposium on electric transportation, the Electric Vehicle Symposium is scheduled to hold its 29th event in Montreal, June 19-22, 2016. Electric Mobility Canada is proud to have played a role in bringing this important event to Canada and to co-host this upcoming international symposium. See the list of EMC members who also exhibit at EVS29. See the Directory of Canadian Industries who were exhibiting at EVS29. Jump Start your EVS29 B2B by downloading our mobile App! Four days of EVs, Networking, and Fun! The Ride, Drive & Charge event organized by EVS29 offers the opportunity for the general public to test drive some of the electric cars available on the market in Canada. Car manufacturers will make their latest electric car models available to the public! A unique opportunity to test drive the electric drive technology. 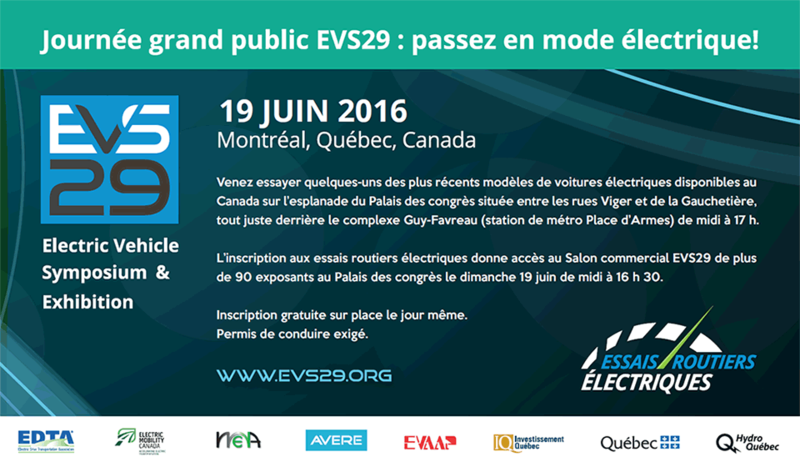 The public is also invited to visit the EVS29 Trade Show from noon to 4:30PM. 90 exhibitors from all over the Word are participating in this Trade Show.